Lord Peter Hain has branded a decision to sack Owen Smith from his position as shadow Northern Ireland secretary as a "terrible Stalinist purge". Writing on Twitter, the former Labour party secretary of state was responding to the decision by party leader Jeremy Corbyn. "This is a terrible Stalinist purge," he wrote. "@OwenSmith_MP has been doing a terrific job on Northern Ireland he’s ideal for the role with his experience expertise and considerable ability. Widely respected. In a Shadow Cabinet with few big hitters he was definitely one." The decision to remove Mr Smith from his position was made by Labour leader Corbyn on Friday evening, and comes after Mr Smith advocated for a public referendum on a final Brexit deal in an article for the Guardian. In it, Owen Smith said the damage a "disorderly and ill-thought-out Brexit could do in Ireland is enormous". He will be replaced by Rochdale MP Tony Lloyd, the current shadow secretary for housing. In a statement posted to his Twitter account, Mr Smith wrote: "Just been sacked by @jeremycorbyn for my long held views on the damage #Brexit will do to the Good Friday Agreement & the economy of the entire U.K. Those views are shared by Labour members & supporters and I will continue to speak up for them, and in the interest of our country." In a statement, Labour leader Jeremy Corbyn said: "Tony is a highly experienced former Government Minister who is committed to ensuring that peace in Northern Ireland is maintained and helping to steer the devolution deal back on track." Newly appointed Shadow Secretary of State Tony Lloyd said: "As we leave the European Union, ensuring there is no hard border between Northern Ireland and the Republic is of paramount importance and this will be my number one priority. "This is an incredibly important job, with a huge in-tray and I am looking forward to starting work." SDLP leader Colum Eastwood wrote on Twitter: "Very sorry to hear that we're losing @OwenSmith_MP as Shadow Secretary of State. Owen has a great grasp of the issues affecting us here. He particularly understood the challenges of Brexit and was very supportive of sensible solutions to help us avoid a hard border." Alliance Party leader Naomi Long wrote on Twitter that she was "genuinely sad to see this". "Thank you for all you've done as Shadow NI Secretary, and for speaking up clearly on #Brexit, an issue which has profound implications for us all, but nowhere moreso than here in NI. "Keep being a voice of sanity in the midst of this #Brecklessness." she wrote. 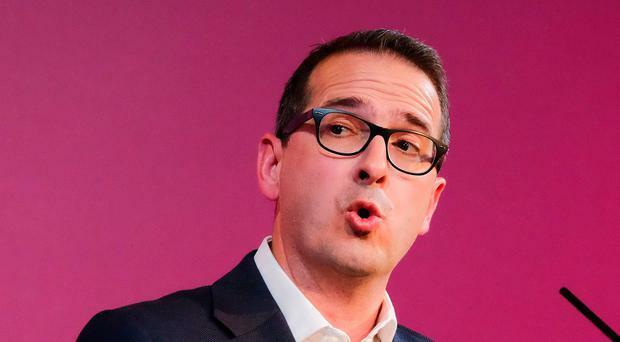 Owen Smith ran against Jeremy Corbyn for the leadership of the Labour Party in the wake of the Brexit vote in 2016, with one of his main policies being a second referendum on a final Brexit deal.